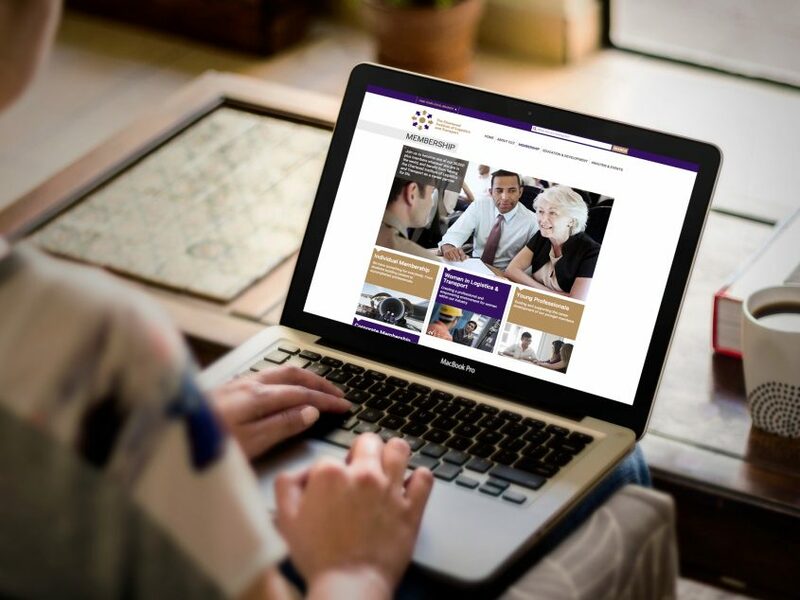 We worked closely with the in-house team to ensure the new website was tailored to the users’ needs whilst balancing the requirements of a global membership network. 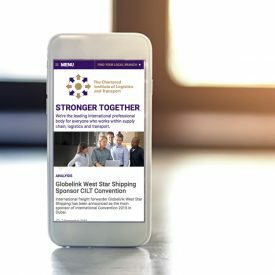 The Chartered Institute of Logistics & Transport (CILT) have been around since 1919, over that period they’ve seen the world and their membership change and grow. The international parent organisation, CILT International rebranded a few years ago, but were left with very minimal guidelines or support. 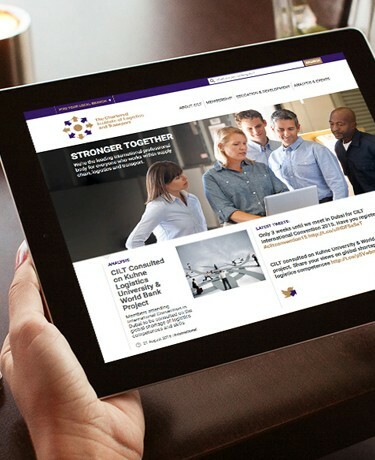 We were brought in the help bring their brand to life, both on and off line. Some of the key things we noticed as part of our research, was just how jargon-based and colloquial their content was. When considering an international audience from whom English might not be their first language, it’s essential that content is both clear and simple to understand. We also noticed how few people featured in any of their imagery, as a membership organisation that’s sole focus is people, this felt like a disconnect. As a result of our findings, we focused in the first instance, on getting their brand right. This start with developing their brand guidelines, to establish a tone of voice and a way to move forward their visual language. 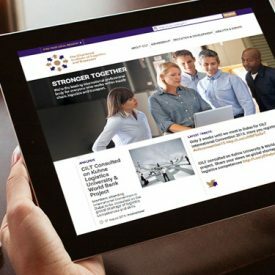 Using the insights we’d gained from the user research and journey planning, we provided a comprehensive information architecture and content plan for the new website. This was a way the organsation hadn’t worked before, so we worked closely with the team to ensure they got the results they and their users needed. As we were only working on one of many CILT’s global websites, we discovered through the process that user’s often didn’t know which country’s website they were landing on, this was backed up by their analytics. To help solve this problem, we developed a ‘country selector bar’ that could be used across all/any of their international branches websites, as well as their own. The bar states the country name, and allow users to navigate away to their correct country website if desired. There were a lot of different templates that we required to suit the different user and content requirements. 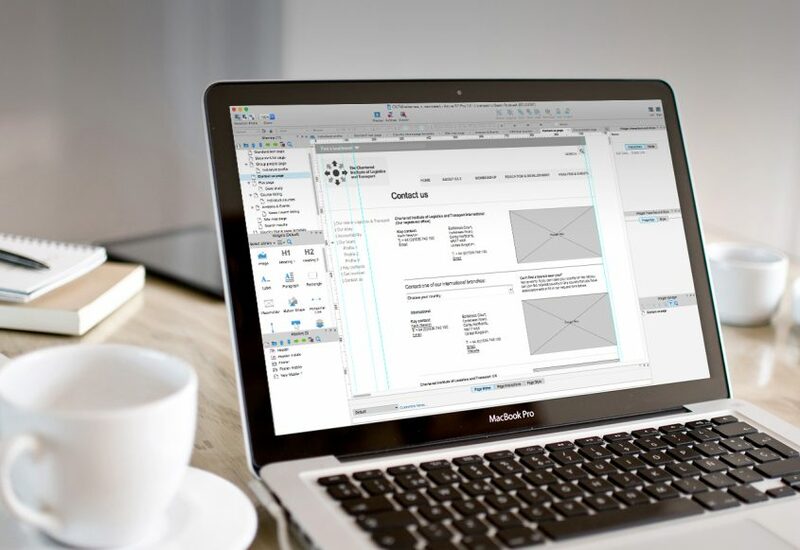 We spent some time planning the wireframes and ensuring that the content was fit-for-purpose from the user’s perspective but also how it would reflow for mobile devices and how tasks could be managed. When it came to the content planning we helped with auditing what content was currently available, to see what gaps needed to be filled. We also supplied advice around the tone and style for the content creation, as well as picture researching and guidelines. As resource was limited, it was important that we worked smart and provided as much help and support to the in-house team. For the future, we helped sense check how content would be managed and what we could do to ensure the website supported them and their users. The responsive interface design was developed from the newly developed brand guidelines. We kept the design clean and clear to aid movement through the site and also support download speeds for mobile users. Where possible and necessary, we included imagery that focused on people, which made a massive impact when comparing the site to its previous guise. Unfortunately due to time and budget limitations we had to use stock, but the team plan to develop their own imagery library over time and replace these. Still, images that fit the ethos of the organisation and the user’s expectations are ok by us. Overall the new website has been a great success and is due to be adopted by their branches all over the world. We liked: the feedback from the membership and the client has been brilliant. We were so chuffed when they said, “the website is everything we’d hoped and dreamed of”. Now that makes getting out of bed all the more worthwhile.